I am very happy to announce that I have joined Forrester Research as the company's first Online Community Manager at their Cambridge, Massachusetts headquarters. In my new role at Forrester Research I will be working to develop further the company's existing social media strategies for community building, dialogue and customer feedback. Role: It's been my goal to work in social media strategy and community management for a major brand, Forrester & the job are an excellent fit. Company: For me, Forrester combines two passions in my work life, technology and marketing. Process: Having a problem and a template to fix a business problem is half the battle in business success. Forrester helps nineteen different technology and marketing roles to solve every day business problems, through methodologies, research reports, events, strategy, consulting and much more. People: I was extremely impressed with the team of people I met during the interview process. Plus the team of analyst colleagues I know through reputation; Charlene Li and Josh Bernoff who recently co-authored the book Groundswell, Jeremiah Owyang and Peter Kim who I had the pleasure of meeting at a recent workshop on Social Computing. Although my blog PR Communications has PR on the masthead, most people probably don't know I started my business career in sales and business development. I've concentrated most of my career in technology companies, from IBM, to resellers, to software companies, to interactive agencies and an online printing company. I moved into the online marketing and search engine optimization industry while working at Portent Interactive in Seattle, which led me to developing my personal blog, PR Communications, in 2003. Since then I've run three corporate blogs at two brands and one agency. My agency blog at Backbone Media, Blog Survey, was in support of the Corporate Blogging Survey 2005. That Blog became the company's most active blog in support of the company's blogging service, SCOUT, which sought to combine SEO, PR and blogger relations to cut down on the time it takes to blog through monitoring, strategy, and supporting subject matter experts who blog. 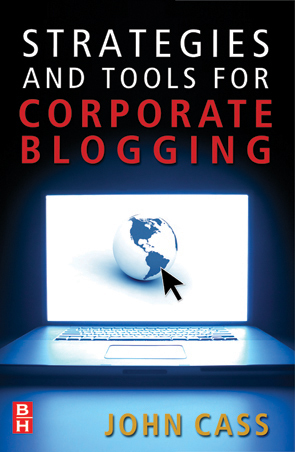 The work I’ve done on my blog and Backbone Media led to a book contract with Elsevier, which I published in April 2007 called, “Strategies and Tools for Corporate Blogging,” a book about how to build effective corporate blogs. I am looking forward to working with everyone at Forrester Research, their clients and the rest of the community in helping to develop further Forrester Research’s use of social media.